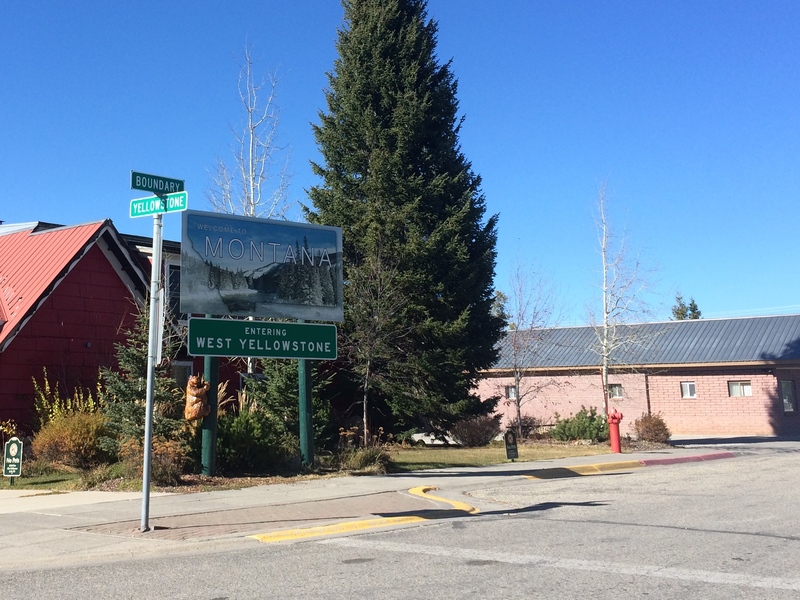 Yellowstone is the suburbia of national parks; its vastness spreads across more than one state and the substantial distance between the sites, trailheads, and camping grounds make me wonder if its visitors spend more time in their cars or the wilderness. 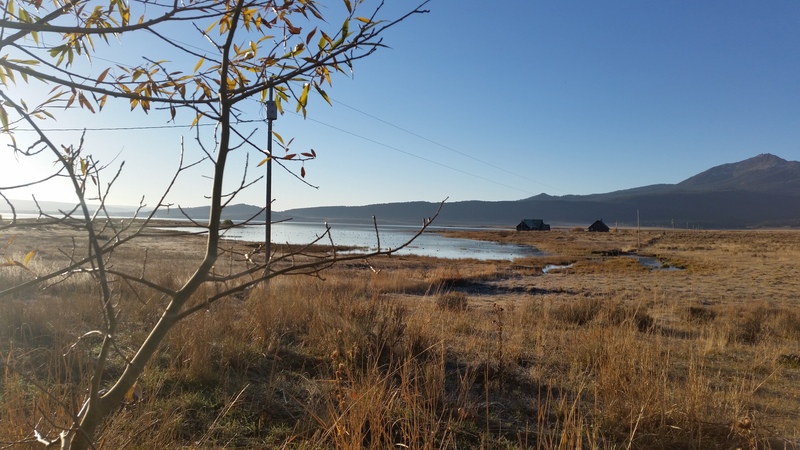 When we arrived during the last half of October, two roads had already shut down for the winter and all campgrounds but one near the far southern entrance remained open. 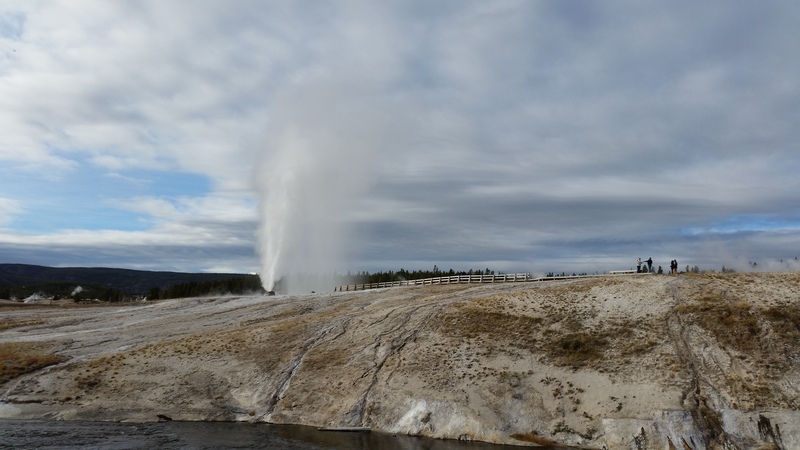 Had we camped in Yellowstone, it would have been a 2-hour+ drive to Old Faithful, Yellowstone’s most famed geyser. 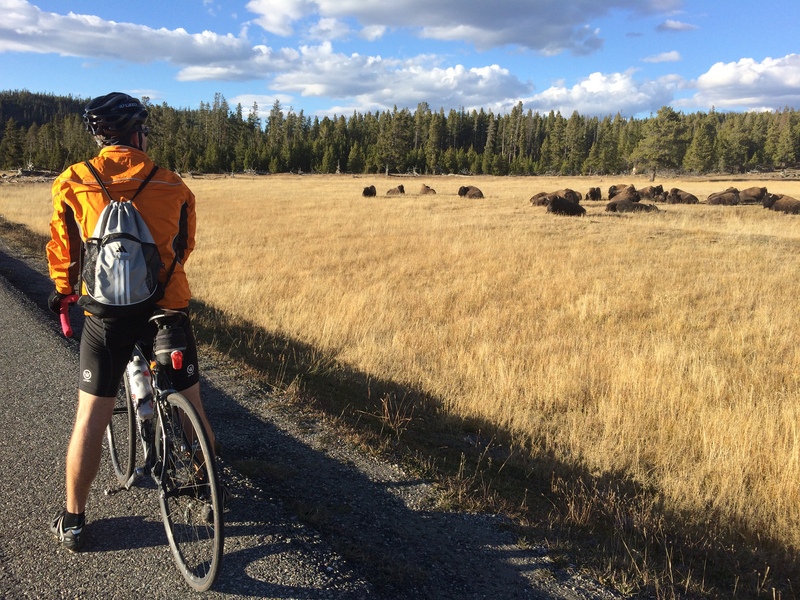 Due to the prohibition of boondocking within the park and its vicinity, we ended up boondocking at Bill Frome County Park in Idaho, a 20-mile drive from the West Yellowstone entrance. 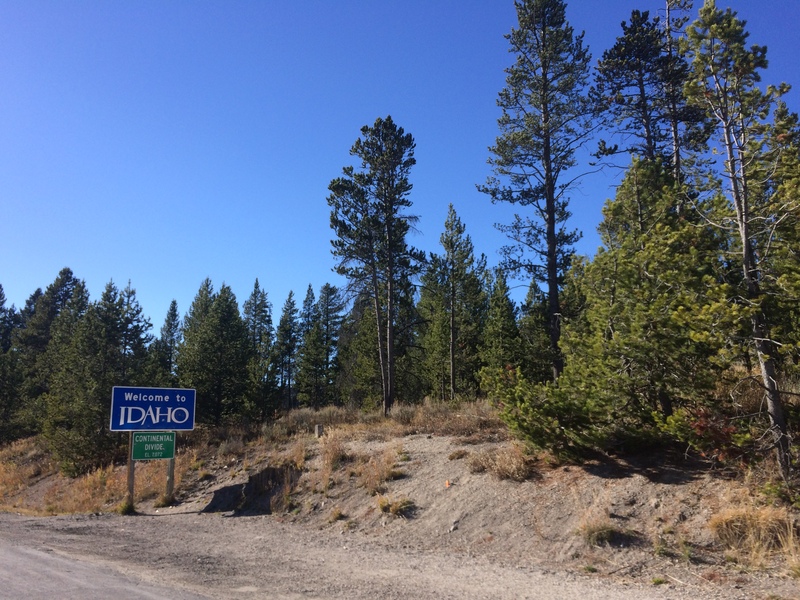 To get there, we drove from Wyoming through Montana and into Idaho! 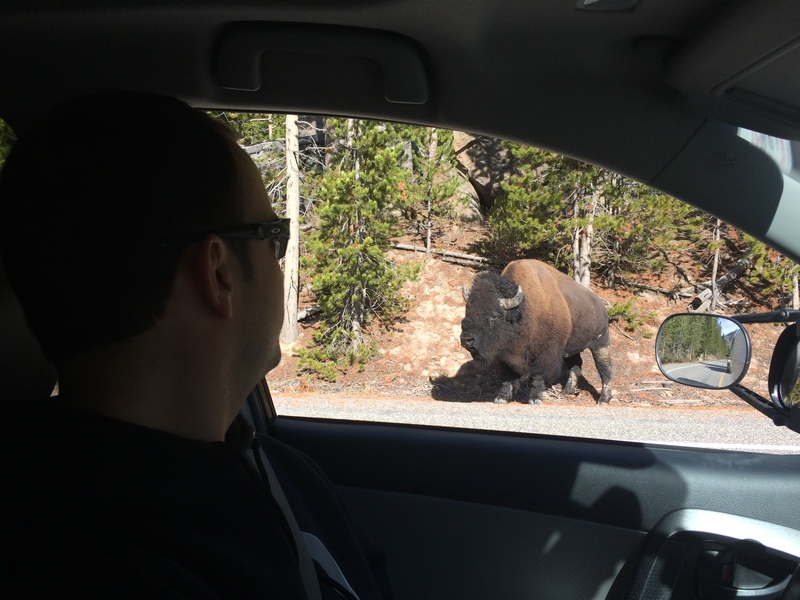 We didn’t mind the drive at all. 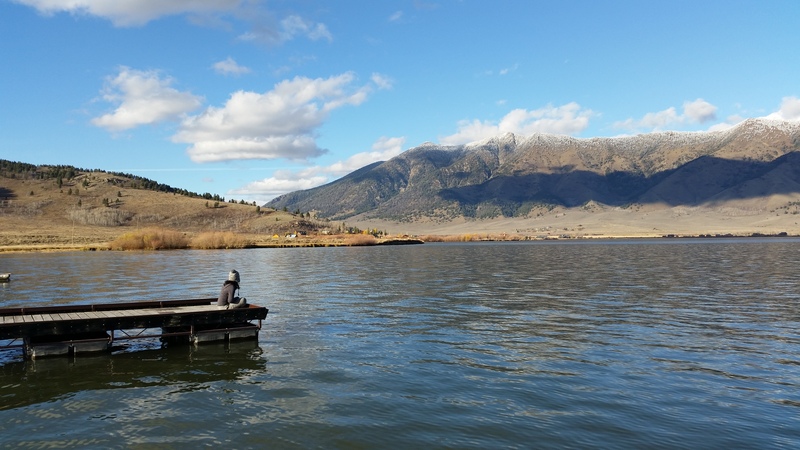 There, we camped for free along a placid lake surrounded by crunchy autumn leaves with snow-dusted mountains in the distance. We were embraced with serenity. 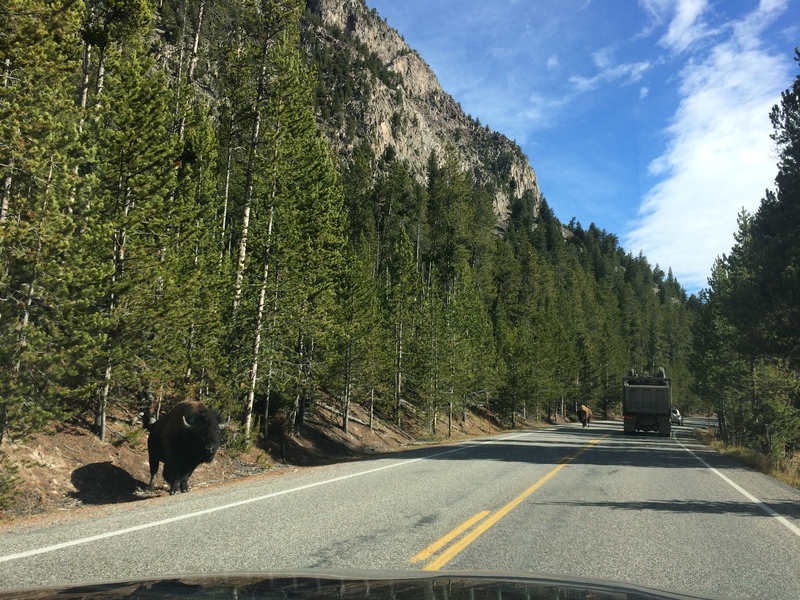 For the following four days, we drove to and from Yellowstone Park. 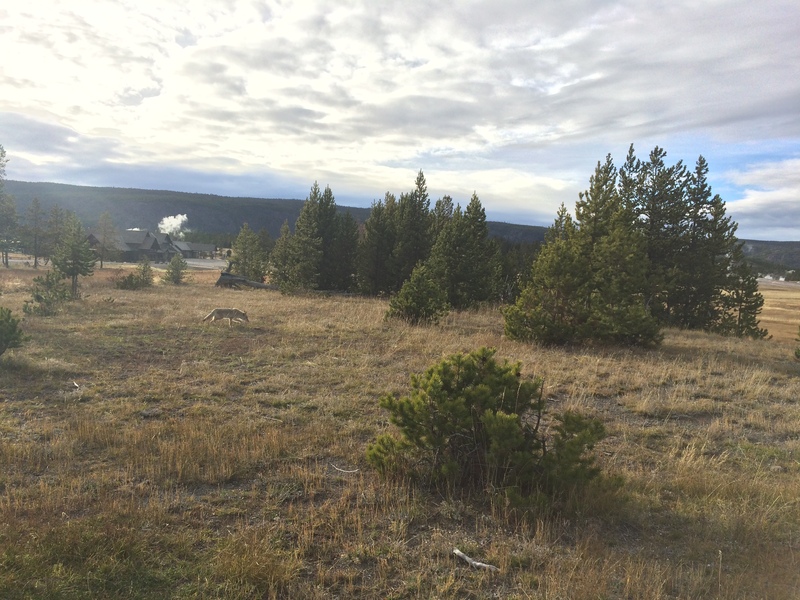 Yellowstone’s wilderness is perhaps the largest wilderness I’ve ever visited. 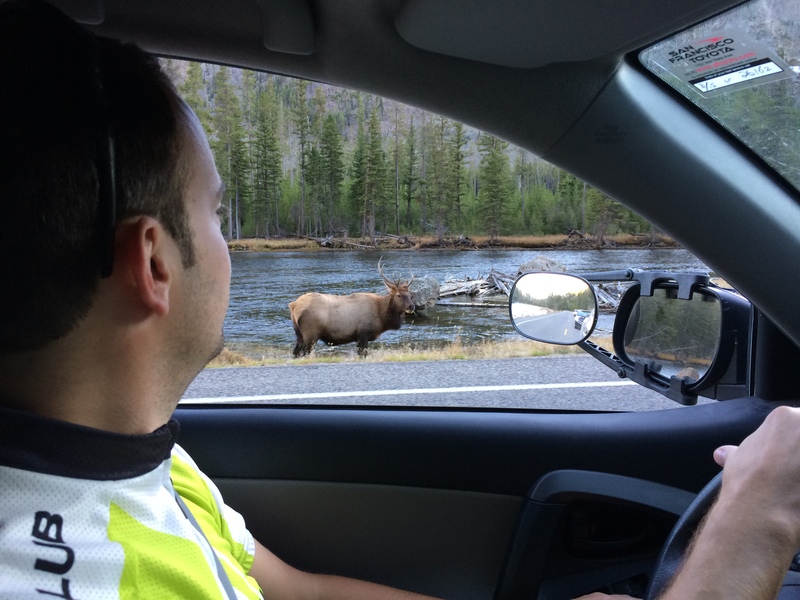 A couple cars pulled off along the side of the road would easily trigger a chain reaction of multiple cars pulling over, with drivers and passengers excitedly scanning the wilderness for wild animals to photograph. 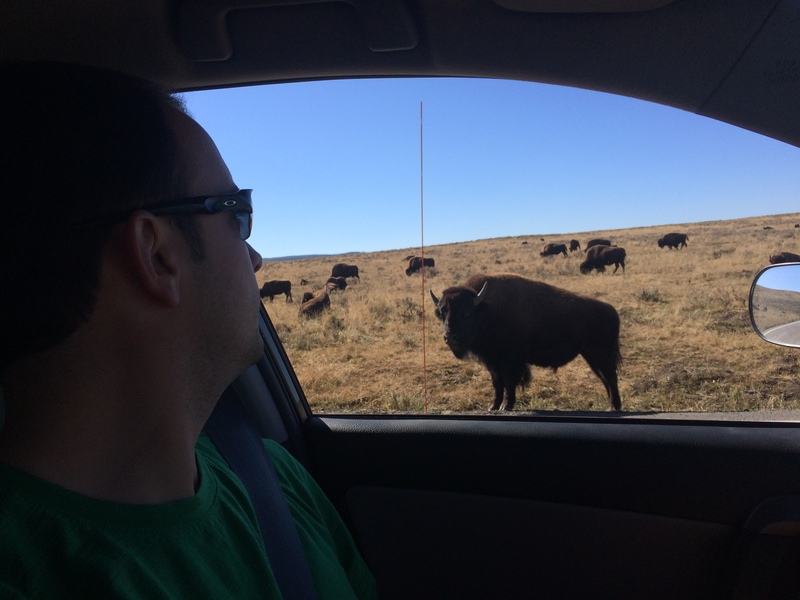 Bucks, elk, antelope, and bison were common. 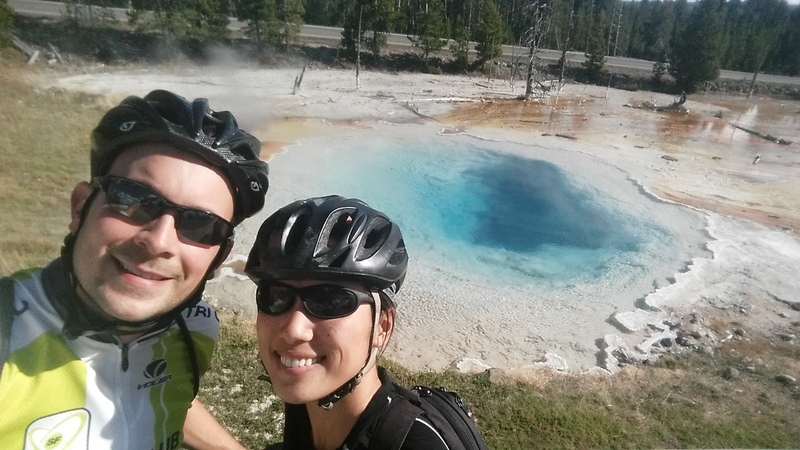 Fortunately we were able to take advantage of an unusual, warm day for our first day by cycling to Old Faithful from Madison. 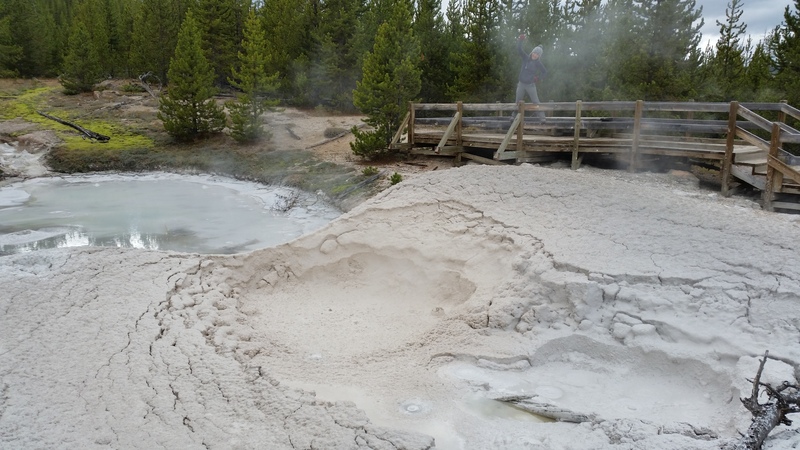 We stopped by several geysers and “paint pots” along the way. 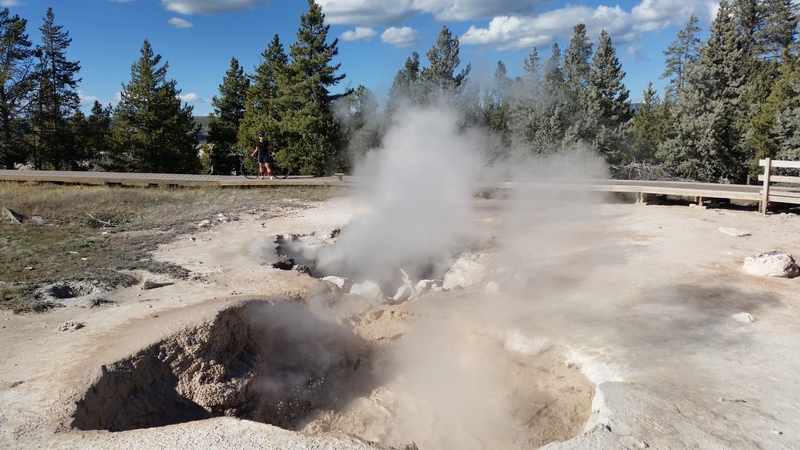 As a geyser virgin, I was in awe of the gurgling mud holes, hissing steam, sizzling pools, and spurting geysers–truly some of Earth’s rarest geological treasures. I often joked about bubble and smoke machines being placed beneath the surface as a special effect; it felt too surreal to be an act of nature. 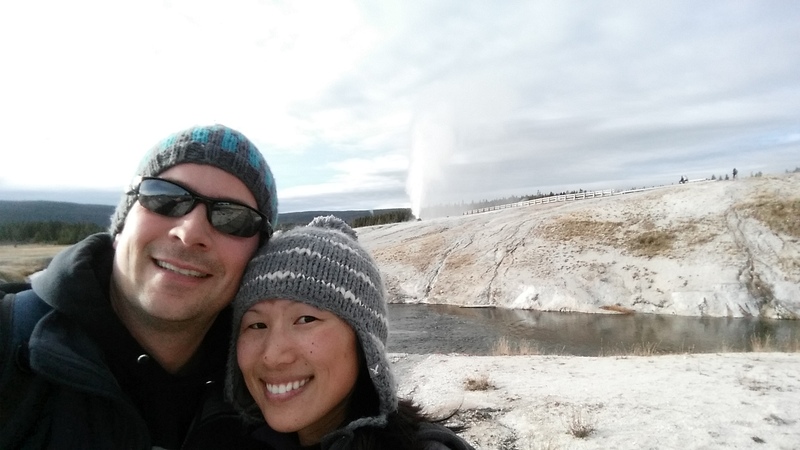 Then we eventually made our way over to Old Faithful. Our jaws dropped when we saw the size of the empty parking lot; it was probably as big as Walmart’s. We again muttered to each other how thankful we were for coming not only on a Monday, but during the off-season. 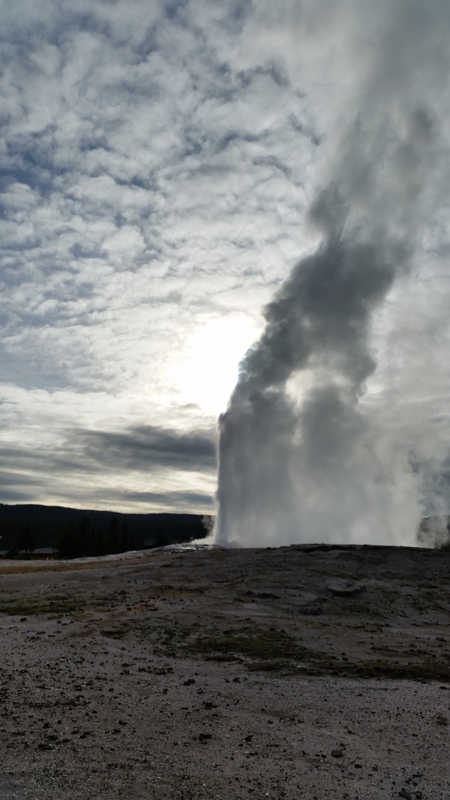 Even Old Faithful’s geyser was treated like a live orchestra. 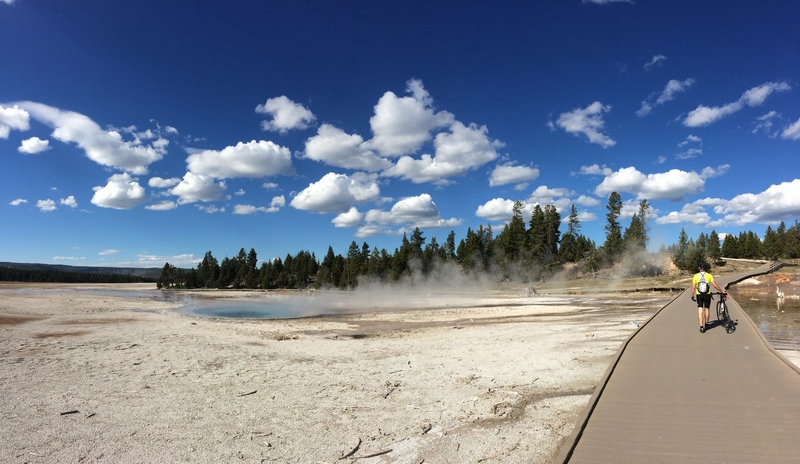 Benches lined the south western perimeter of the geyser and park visitors (mostly retired couples) scattered here and there waited patiently with their SLRs or iPads clutched in their hands. 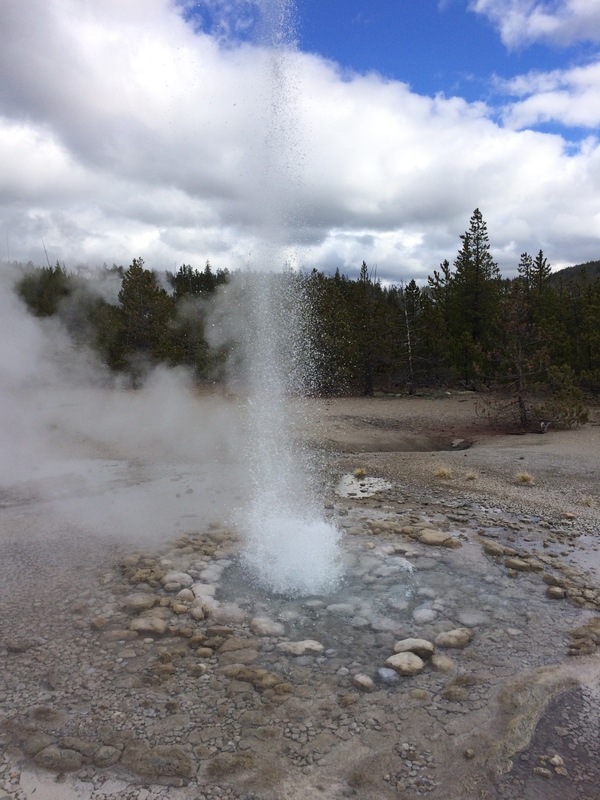 The eruption itself was overhyped and short-lived (perhaps under a minute), but pretty cool nonetheless. If we were there in the summer shoulder-to-shoulder with aggressive tourists and their children, we probably would have felt differently. 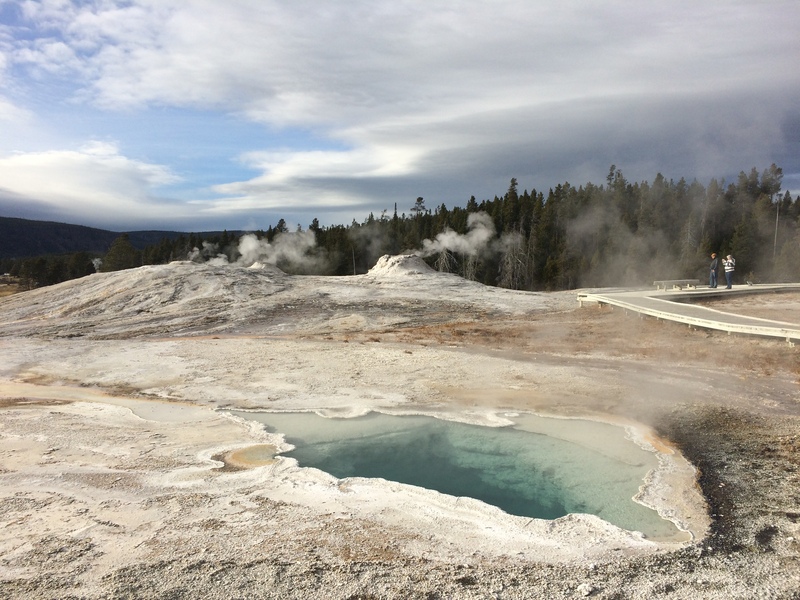 Immediately after the eruption there was a short applause and the audience dispersed to escape the early evening chill. 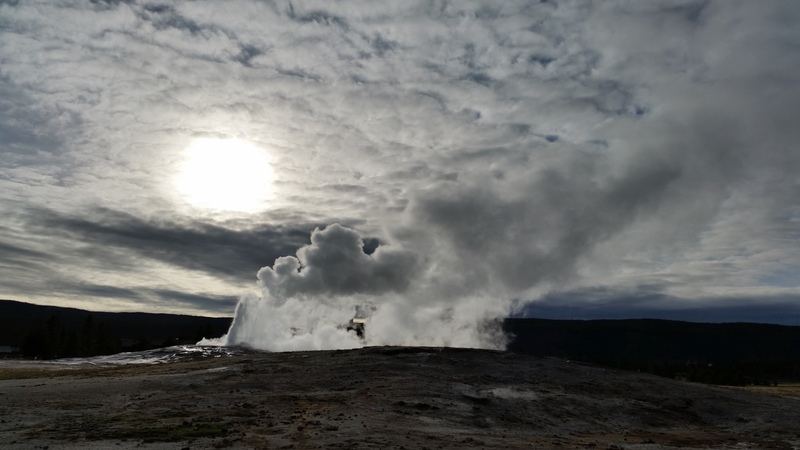 The plan was to explore Old Faithful’s surrounding pools after the eruption but we could see thunderclouds slowly creeping in from a distance. 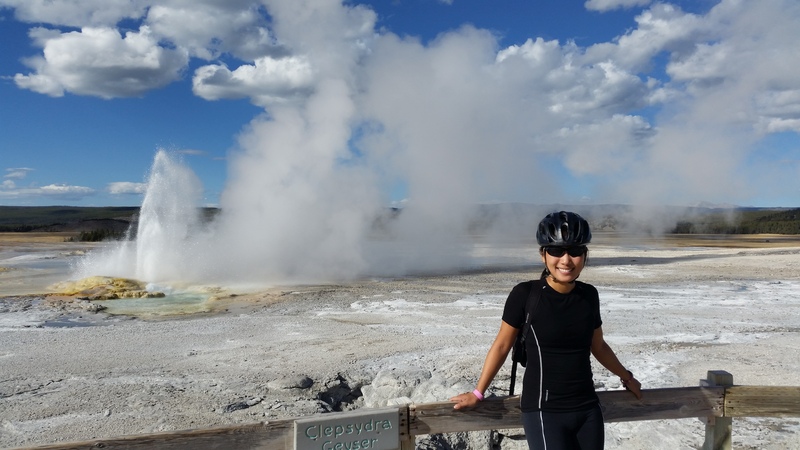 We knew from experience that cycling in the rain and cold can be miserably painful so we quickly headed back to Madison and decided to return to the Old Faithful area another day. Hail, freezing cold, and prevailing winds forced us to dwell as hermits the next day. 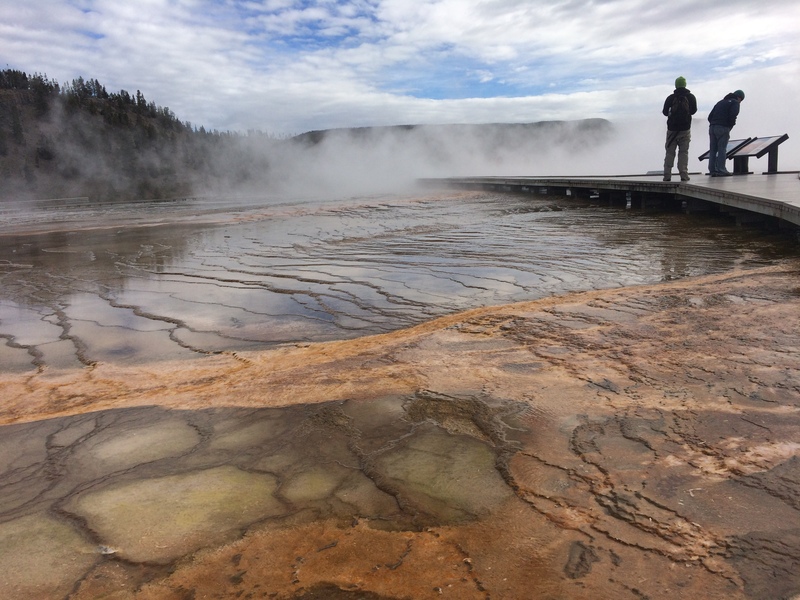 Though the storm’s frigid remnants lingered the next several days, rain did not fall, and so we explored Yellowstone some more. 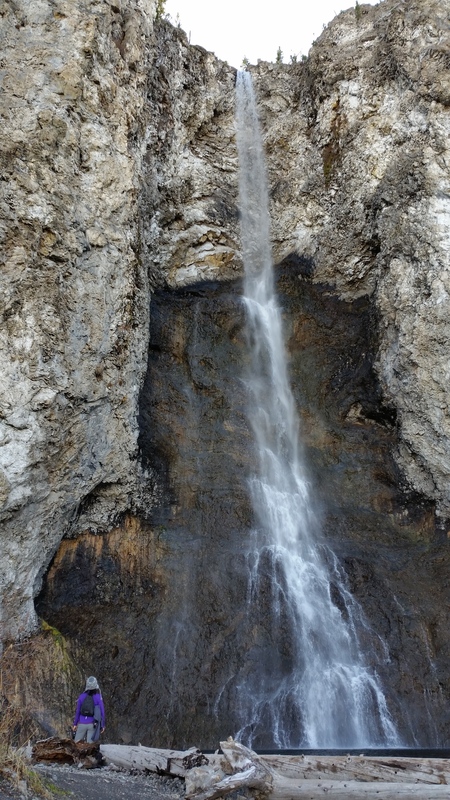 Due to the winter road closures, we were unable to hike Mt. 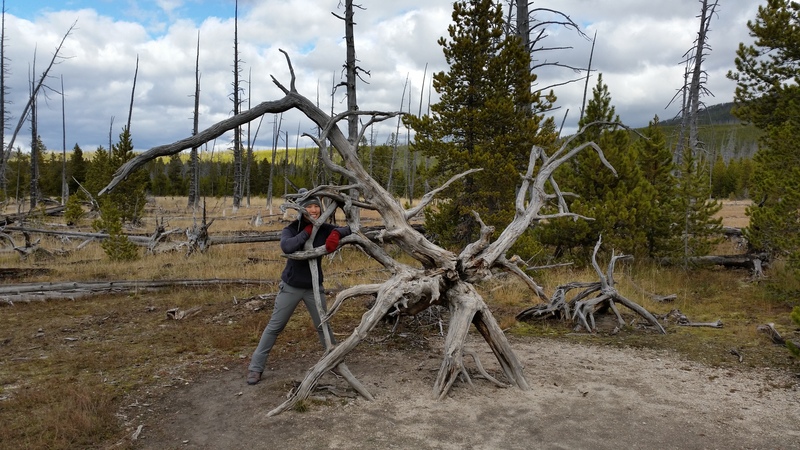 Washburn, one of Yellowstone’s longer, epic hikes. 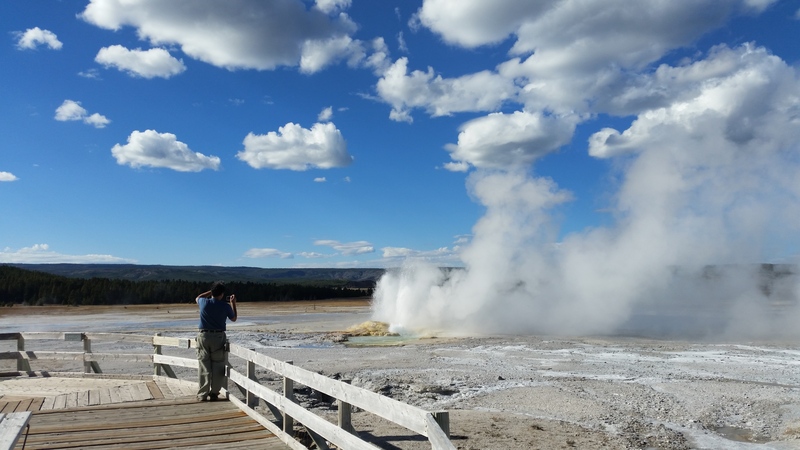 Yellowstone ended up resembling more of a museum filled with Earth’s picture-worthy natural gems than a national park filled with scenic hikes. 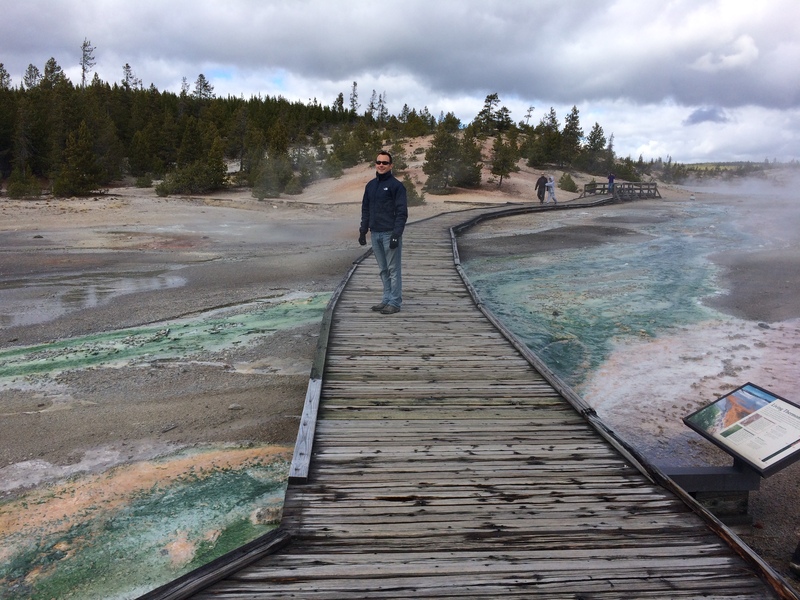 We spent an afternoon scoping out the geysers and “paint pots” between Norris and Madison. 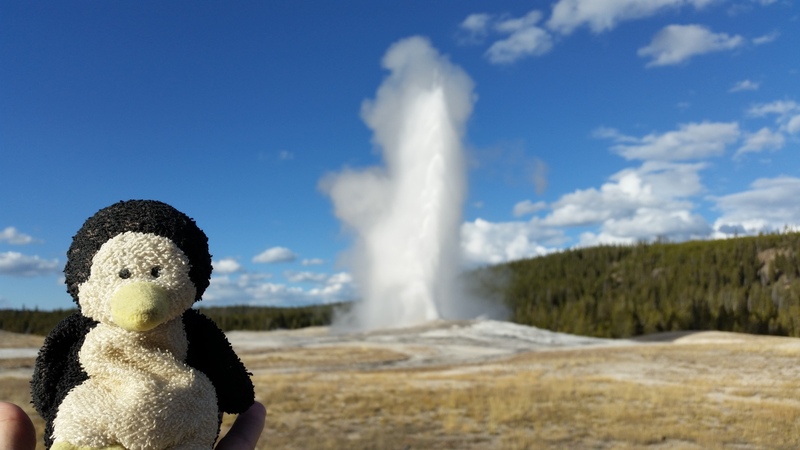 And we spent another day revisiting Old Faithful, this time checking out additional sites between Madison and Old Faithful. 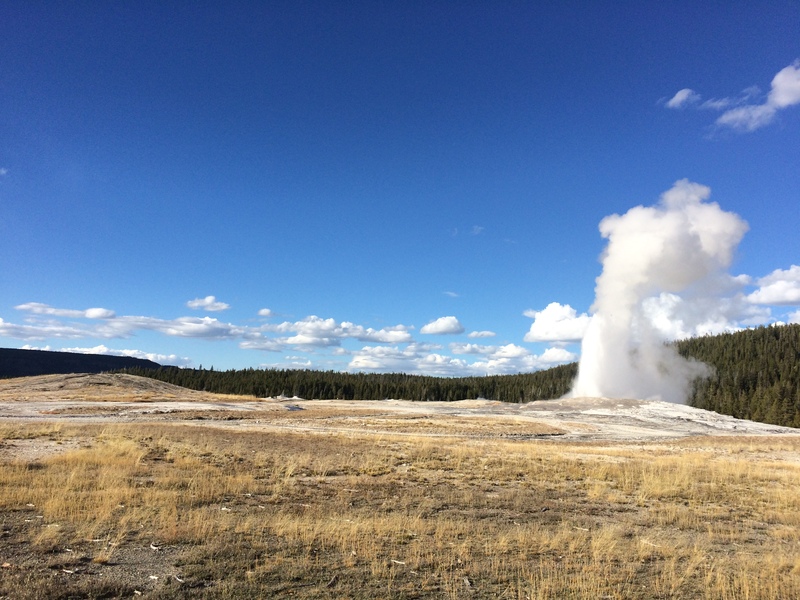 Due to the weather and Yellowstone’s limitations and road closures, we only spent a total of four days at the park which was ample time to ogle over the attractions. 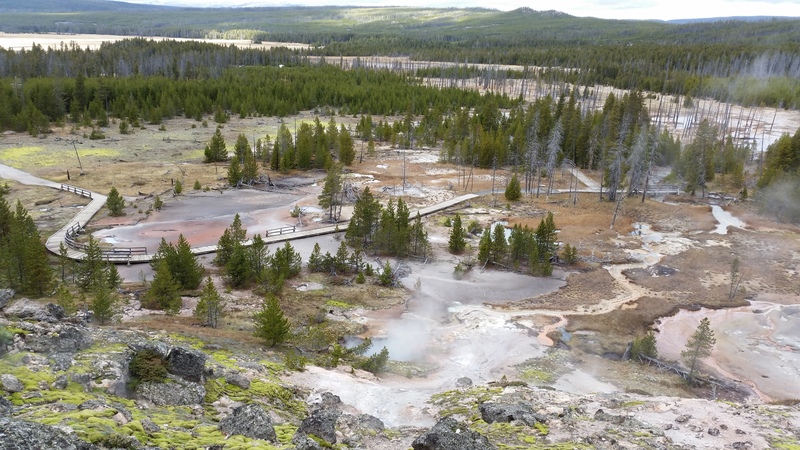 Since Yellowstone’s geological features are the rarest in the world, a visit to this park would be a treat for anyone, old and young. 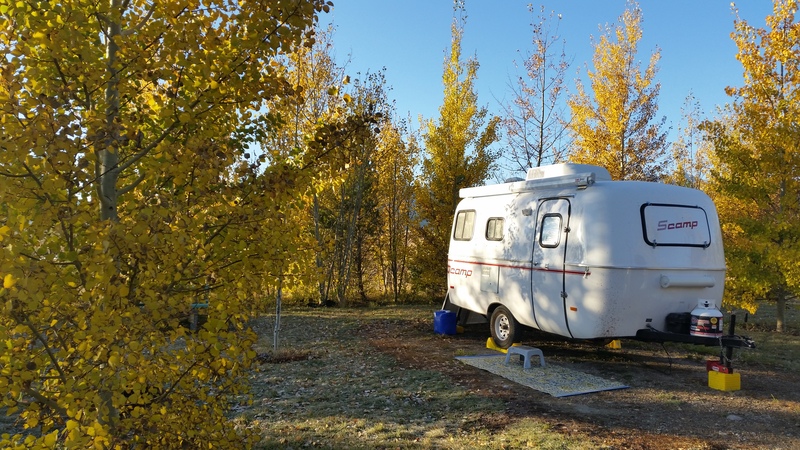 But after spending 1.5 weeks boondocking in the wilderness, we were ready for our next metropolitan destination filled with diversity and fine dining and booze: Denver. 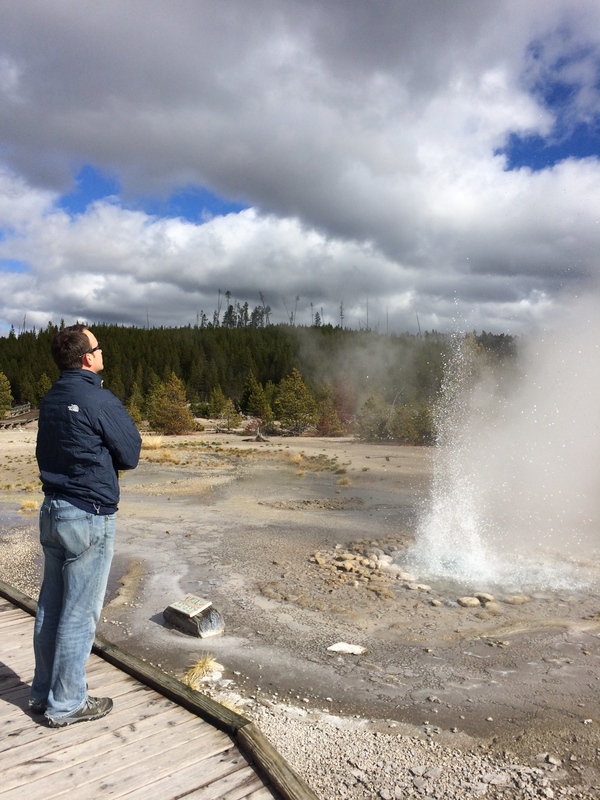 This entry was posted in Wyoming and tagged geyser, Old Faithful, yellowstone. Bookmark the permalink.